Whale Watching - at Spanish Banks?!?! Lisa and Ethan have been in town for the past week, which has been a lot of fun. Sadly I couldn't take any time off work to hang with them, but we did spend a fair bit of time on the weekends. I'll add a couple of posts with some pics to share. On the Sunday while they were in town, we booked a whale watching trip so they could (hopefully) see some orcas. 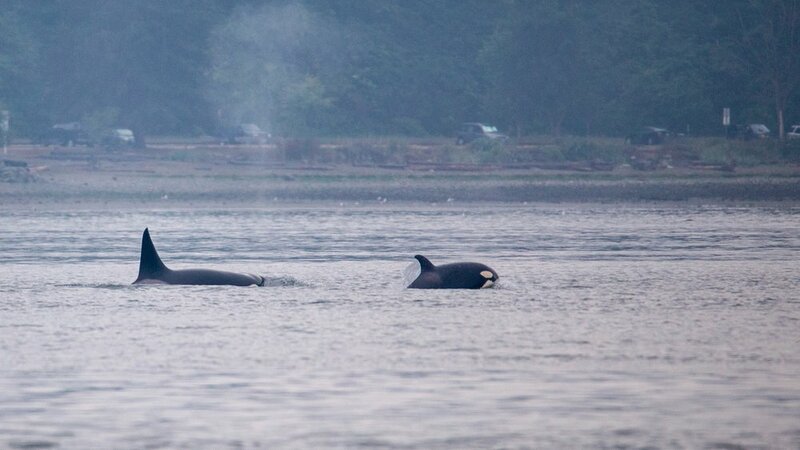 Not only did we see them, the boat ride was less than 5 minutes as they were in English Bay, right off the beach near Spanish Banks! Our briefing as were were about to head out on a grey, overcast morning. While we were getting suited up in the office of the whale watching boat, it came over the radio that there was a pod of transient orcas in English Bay! This is super-rare (the naturalists' comment was "they are close enough the city will go crazy"), and meant we had less than a 5 minute boat ride out to where they were. We first spotted them in amongst the tankers that are always anchored in the bay, and followed them out past Spanish Banks - a place where we've been in the water frequently, then out past the tip of UBC. It was quite amazing, so I'll just throw up the pics I got. You can see the swimming markers just off the beach, just past the orca. Crazy close to shore. The object in the background is a Howitzer bunker from WWII. Something interesting that the captain pointed out. After following the orcas for a while, the captain cruised up into Howe Sounds, passing by Lighthouse Park in West Van and going up amongst the islands in the sound. It gave us a chance to see a bunch of harbour seals that were having out in what turned into a nice, sunny day.